PLEASE NOTE: Doors open at 9:30 A.M. It begins at 10:00 A.M. and ends at 4:00 P.M.
Join award-winning artist, John Whytock, in a 6 hour workshop where you will learn how to create a unified and harmonious painting using a limited palette. He will discuss the use of limited pigments to create an extensive color spectrum, and how to reduce the complexity of painting into a simpler and more elegant approach. This workshop is intended for beginning to intermediate painters, and will be done in acrylics. Times: 9-3pm Thursday May 30 and Friday May 31. Contact Alicia Farris to register and to reserve your spot. Alicia Farris will share her studies of the human face and figure in this two-day watercolor workshop. Using Alicia’s characteristic loose and colorful style, you will learn techniques to portray not just a likeness, more importantly, the personality and emotion of the human face or a subject. Students will benefit from demonstrations as well as discussion, individual and group critiques. Sample photos for the first day will be supplied to all students who register along with the supply list. Students will have the opportunity to work from their own photo if they wish during the workshop. Workshop times will be 9-3 each day. Please Note: Door opens at 12:30 P.M. Class begins at 1:00 P.M. and ends at 4:00 P.M.
Join award-winning master artist, John Whytock, in this series of workshops and learn many of the techniques that allowed him, for the past 40 years, to excel in the real world of competitive art. This is session one of the series and will focus on ‘Sky and Clouds’. You will learn which colors to mix that will produce the most pleasing and convincing sky blue, which color to add as your sky approaches the horizon, and how to keep from ruining the effect by over saturation. Learn the basics of cumulus cloud painting, the importance of design, and how tonal values contribute to your believable sky. We are in the fourth month of the year - much has changed since you set your intentions back in winter. Let’s get together to reset, reevaluate and realign with our intent for the year. All you need is an intention and to be ready to play with color & brush. No experience needed! Or if you would like to pay by check please contact me in regards to an address. Lets hop into spring and paint rabbits!! This workshop is for the intermediate to advanced student. Workshop is a 2 day event. Each day will be 9am to 4pm with a 1 hour break for lunch. Students will be encouraged to loosen up and let their brushes dance. Each morning will begin with a quick demo and discussion period explaining several processes in starting a painting while giving emphasis on the importance of shape, line, form and the values of the subject. Each day students will have demonstrations on how to use their brushes in a expressive and energetic way to help create energy and life. Instruction on having a cohesive color harmony with in your painting will be share as well as lots of color mixing! Reference photos will be provided for all. This will be hands on and so much fun! Bring your creative spirits and open mind and lets paint rabbits. Below are the supplies needed for my class. Oil paint colors…. Cadmium yellow light, cad yellow medium, permanent orange, cad red medium, alizarin crimson or permanent rose, burnt sienna, ultramarine blue, kings blue (jack richeson brand), radiant turquoise, viridian, titanium white, light grey, medium grey. Brushes…..are so important! Good brushes are key to great brushwork. Brands I use and love are Rosemary Brush CO, Silver Bristleton, Grey Matters and Robert Simons Signet….all can be found online. synthetic and sable are what I enjoy. Flats sizes 2,4,6,8 Filberts 2 thru 8 Rounds 2 thru 6 Egberts are long filberts 4 thru 8 they give a nice calligraphy mark. I also use what are called shapers. They are rubber wedges that help me to move, shape and scrape paint back. Canvas …may bring boards or stretched canvas. I am in love with linen pads by Centurion or pad canvas by YES. But every painter has their surface they enjoy. Bring good quality for better results. Sizes in ranges of 8x10, 9x12, 11x14 or 12x16 enough to do multiple quick sketches and exercises. Gamsol for cleaning brushes (no carpenter grade cleaners) . tank to clean brushes in. Table easel or floor easel, paper towels, large palette to mix on…no paper or styrofoam plates! Grey or white pallette paper is good as long as you have a sturdy support to mix on. I use a french mistress that fits on my easel. Palette knives in medium or larger sizes. Trash bags and handy wipes. Create this “Make & Take” Batik painting using watercolor paints, rice paper, and a few household tools. PLEASE NOTE: Doors open at 9:30 A.M. Workshop begins at 10:00 A.M. and ends at 4:00 P.M.
We are 10 weeks into the year. How are you doing with your intentions? Where has the year taken you? What is real now? Let’s get together to reset, reevaluate and realign with our intent for the year. All you need is an intention and to be ready to play with color & brush. No experience needed! Have you studied color theory and still struggle with developing a pleasing color scheme for your paintings and drawings? This theory workshop applies for ANY art medium and will enhance your color knowledge. I’ll share the formulas to help you dramatically change your color schemes from “so-so” to WOW!! Included in this $45 workshop: 25 page Color Scheme Kit, instructions, demonstrations, examples and fun exercises, and studio fee. Time includes setup and clean-up. Paypal available. 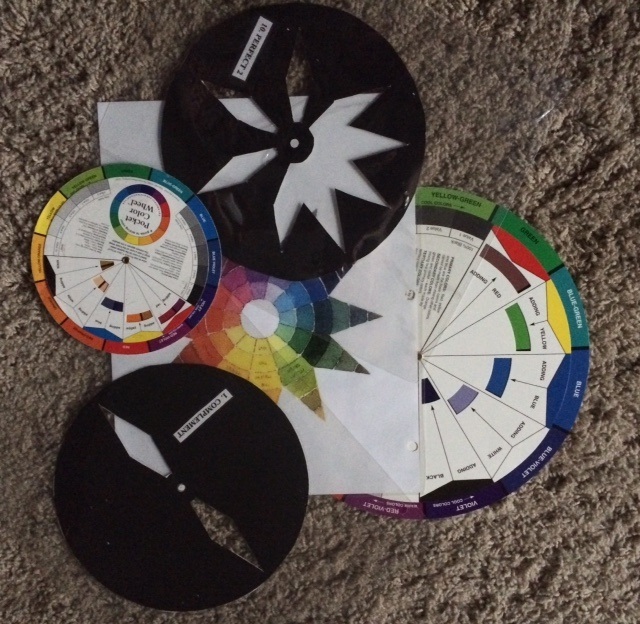 What you need to bring: Scissors, double-sided scotch tape, permanent marker, 1” 3-ring empty binder and the color wheel you use. In addition, bring your own art medium and supplies to participate in the exercises. THIS WORKSHOP WAS RESCHEDULED FOR 2/23/2019 DUE TO UNSAFE TRAVELING CONDITIONS. Resolutions Made? ✔ Goals Set? ✔ Now what?????????? We will be celebrating the holiday season by painting a fun, mixed media Santa. Mixing Skin tones, using joint compound, vintage collage papers, lace, pencils, texture, and a variety of mediums to create this fun and jolly Santa. Creating an interesting background and a delightful Santa. Using acrylic and watercolor techniques throughout. A fun time of learning and creating. C’mon… Get your pour on!!! Learn the elements necessary to paint realistic portraits. This includes precision drawing, composition and facial structure, color theory as it applies to portraiture, and how to achieve lifelike representations of faces in oil paints. This workshop is designed for the intermediate to advanced oil painter. Participants must have good drawing skills and have a good grasp of the fundamentals of oil painting. Acrylic Pours - See What Everyone's Talking About! Mixed Media and Collage "Paper and Paint"
This workshop is for any level of artistic work. Come to learn techniques in creating with intuitive views for any subject from photos of friends or family to total abstraction. Choose photos that are meaningful to you and have in mind how you wish to create your story on the canvas or paper. Collect all papers and items that you wish to add to the story and we will take the time to evaluate and step into the joy of knitting it all together. We will use any type of papers you wish from newspaper or phone books to old letters, tea bag cover, soap wrapper, etc. We can use any and all stamps that you have, pencils , crayons, paint, and the kitchen sink. Come to find your freedom in all types of methods for collage and paint. We will revisit the wonderful joy of learning together without fear.